Horizontal & Vertical support beams are made of 14 gauge aluminum, 6063 or 6065 alloy. Available in 2" X 4", 4" X 4" and 4" X 6". 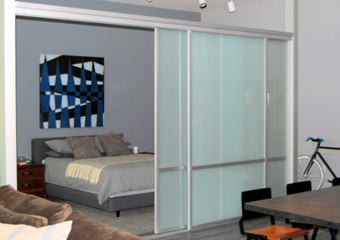 Glass are all monolithic and laminated products are ANSI compliant. Anti-Jump Bottom Rollers are ANSI compliant. Bottom track(s) meets ADA profile requirements and are ANSI compliant. Push/Pull Force meets ADA requirements. Push/Pull rolling performance is ANSI compliant. Hardware system can accommodate an individual door up to 175 pounds in weight. Paint to be Electrostatic Sprayed and be 1.0 –1.4 in mil thickness. 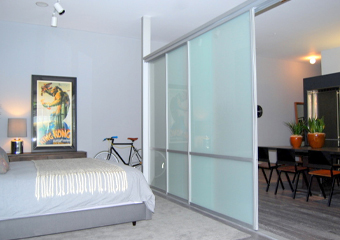 Room Dividers consist of Vertical Stiles that are made of 17 gauge aluminum, 6063 or 6065 alloy, and measure 1-1/2" in width and 1-5/16" in depth. The Horizontal Rails are made of 17 gauge aluminum, 6063 or 6065 alloy, and measure 1-5/8" in height and 1-3/16" in depth. The Top Channel is made of 16 gauge aluminum, 6063 or 6065 alloy. The Bottom Track is made of 10 gauge aluminum, 6063 or 6065 alloy. These products utilize ball bearing bottom rollers and twin top rollers This hardware system can accomodate an individual doors that does not exceed 175 pounds in weight.